Since moving to the Dominican Republic, I have experienced a renewed interest in Dominican cigars, specifically brands to which I’d had no previous exposure while stateside. The impetus for this renewal has largely been Chogüí Cigars, with the Dos77 line. After enjoying the Dos77 and subsequently having the opportunity to spend some time with owner Victor Nicolás on the “Top Secret Nest” production floor learning about his brand, I was excited to try the upcoming Chogüí PrimerAño. This release is a celebration of Chogüí’s first year in business, and was rolled in November 2014 (the time of the company’s Dominican launch). Although the core Dos77 line has now grown to include some U.S. distribution, the PrimerAño is a limited run that will likely only be sold in the Dominican Republic. It was produced in a singular 5.5” x 46 vitola, using tobacco from both the original Primera Edición and the existing Dos77 blends. The wrapper on the PrimerAño is Dominican grown, Cuban-seed HVA (Habano Vuelta Arriba), the binder is Dominican Criollo ’98, and the filler blend consists of Dominican Criollo ’98 and Habano 2020. Pricing is still under review, but are expected to retail for approximately $9 U.S. Samples for today’s review were provided by Victor Nicolás. The wrapper on the PrimerAño is medium brown in color with some mottling. It is silky to the touch and moderately oily. Veining on the leaf is present but unobtrusive. The bunch density feels even throughout the length of the cigar. Once clipped, the pre-light draw is deliberate and mildly sweet with just a bit of spice on the tongue. The wrapper aroma is faint and leathery, with a darker, sweeter presence at the foot. The PrimerAño took to fire quite readily and lit evenly across the foot. There is some tangy spice in the early minutes, which is most noticeable with retrohale. It’s a very pleasant “tropical spice” we’ve discussed so many times on Half Ashed. Whether due to palate adjustment or the cigar itself, this spice subsides significantly within about 10 minutes. It’s largely replaced with a delightful, dusty sweetness and some cedar by the end of the first third. 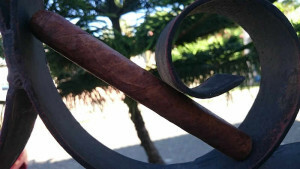 The midsection of the cigar brings a well defined uptick in the strength. The flavors also intensify, lending to a well balanced blend. The earlier sweetness deepens, and takes on a bit of a caramel character. Again, this is most prevalent on retrohale, but noticeable on the palate alone as well. The burn is very well behaved with only a couple minor touch ups to mind the burn line a bit. The final stretch brings continued intensification in strength, although it never becomes an overpowering powerhouse. That being said, you may not wish to smoke it first thing in the morning. The flavors become bolder and somewhat woodsy in nature during this portion of the smoke as well. The woodsy quality is tempered by a bit of dried fruit sweetness. The burn was exceptional during the final third, with no touchups required. While the Dos77 may still be my favorite from the Chogüí lineup, I found the PrimerAño entirely enjoyable. The construction was spot-on, the blend well-balanced, and the flavors entertaining. I am quite impressed with this young company’s early efforts. Both lines I have smoked thus far are firmly in my personal wheelhouse, and have performed well in more objective aspects as well.